Small scale see-through blocks are perfect for younger builders. Set of 18 high-quality, sturdy wooden blocks with smooth edges for safe play. 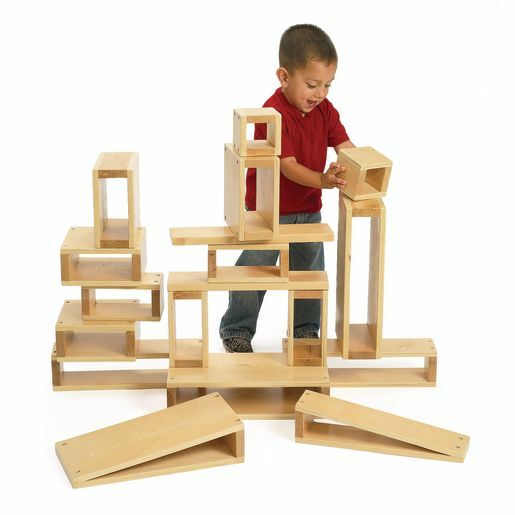 Children can stack, count and add ramps to expand block play possibilities. Includes 8 basic blocks in various sizes. 4 Blocks 4" x 4" x 4"
4 Blocks 4" x 4" x 8"
4 Blocks 4" x 8" x 8"
2 Blocks 4" x 4" x 16"
2 Blocks 4" x 8" x 16"
1 Triangular Block 4" x 4" x 16"
1 Triangular Block 4" x 8" x 16"